Clarke was the first African-American to play varsity football at Colorado and, in a run-oriented single-wing offense, caught 20 passes for 532 yards, an average of 26.6 yards per catch. He was chosen as a future pick by the Cleveland Browns in the fifth round of the 1956 NFL draft and joined the club in ’57. In three years as a backup with the Browns, Clarke caught 10 passes for 212 yards and he moved on to the expansion Cowboys for 1960. He broke out in 1961 with 41 catches for 919 yards and a league-leading 22.4-yard average while scoring nine touchdowns. Cowboys went 5-8-1 to finish fifth in the NFL Eastern Conference while ranking second in the league in touchdowns (51) and scoring (398 points, tied with the New York Giants). Clarke followed up in 1963 with 43 catches for 833 yards (19.4 avg.) and 10 touchdowns. He achieved a career-high with 65 receptions in ’64, for 973 yards (15.0 avg.) and five TDs, and received first-team All-NFL recognition from the Associated Press and New York Daily News. Shifted to tight end in 1965, Clarke caught 41 passes for 682 yards (16.6 avg.) and four TDs. His production declined sharply in 1966 and ’67, his last two seasons. Overall, Clarke ended up with 291 catches for 5426 yards (18.6 avg.) and 50 touchdowns, with 281 receptions for 5214 yards and all of the TDs coming with the Cowboys. 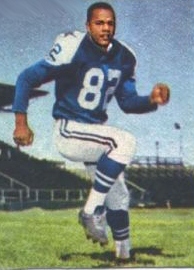 His 14 touchdown catches in 1962 remained the club record until 2007.